On today’s 360°, we will explore a unique home that had the massive disadvantage of having its building site at a cul-de-sac, as well as having its entrance uncomfortably close to the narrow passageway adjacent to the neighbouring home. Add to that, the dead-end location meant that poor lighting would be a real issue. Not surprisingly, this was a difficult plot to sell and consequently, prices had to be brought down. That’s when the Japan-based architecture firm Yasuyuki Okamura took over. A quick browse through their other projects reveals that working with difficult plots is somewhat a specialty for these guys. What looked like a structural impossibility, let alone a logistical nightmare, has today been converted into a warm and spacious home that is full of natural light. Read on to find out how they managed this feat! When the project landed on their table, the architects saw it as a chance to flex their creative muscles but since the land was cheaper to acquire and was limited in space, they were also able to significantly reduce the overall building costs. 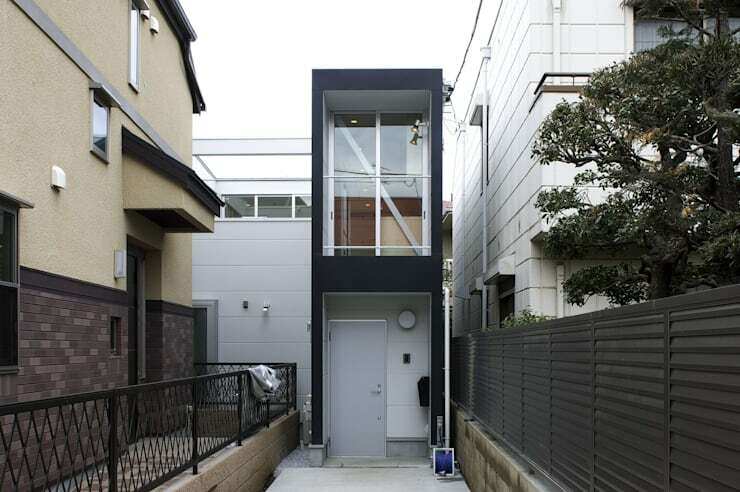 That the building had to have a narrow facade in order to fit its entrance to the alley was a no-brainer. The architects kept the overall design simple, clean and modern as any frills would have seemed over the top here. The end result is a safe haven—a private base, of sorts - instead of a stuffy, cramped atmosphere. The picture that greets you when you enter is one that you simply do not expect. 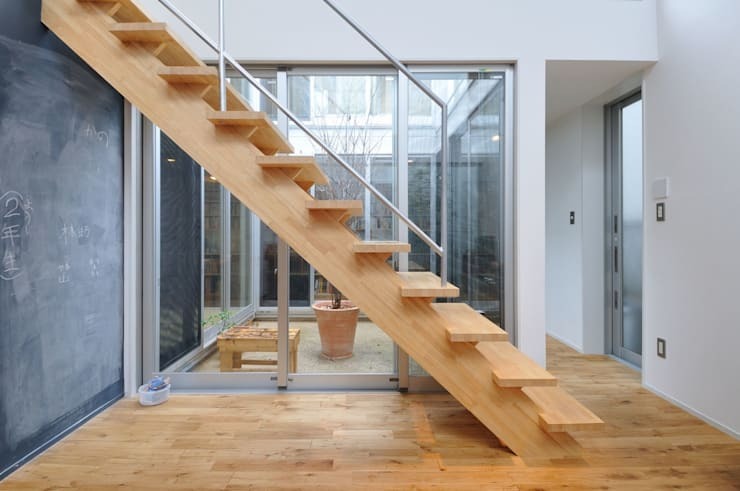 The first thing that you notice is the central interior courtyard around which the rest of the house is designed. This immediately creates an organic and eco-friendly feel, an especially impressive feat considering the narrow exterior. The courtyard also lends an openness to the space that would otherwise have not been there. Since a garden and outdoor seating wasn’t exactly an option here, the interior courtyard also works as a wonderful space for the residents to enjoy the outdoors while having their privacy ensured. There's even a smaller courtyard tucked away at the far end of the living room! 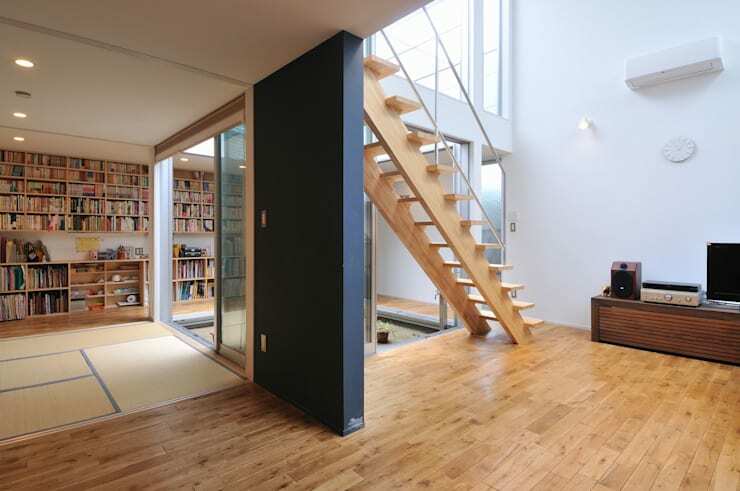 The stairway here not only connects the two levels but also doubles up as a separator between the different zones on the ground floor, doing away with the need for a wall. This of course means that the space feels a lot more open and has a sense of harmony that flows throughout. Under the stairway, a blackboard wall was installed as a doodling area for both the kids and the adults, lending a playful feel to the area. In smaller spaces, it's best to avoid chunky walls and partitions that can make the area appear even more cramped. The interior designers at homify can help you brainstorm ways to make the most of your limited space. From this view, you can get a more wholesome idea of the layout of the interiors. The living area to the right and the library to the left is separated not just by the courtyard but also by an open section laid out in tatami mats, inspired by a Japanese traditional room. This serves as a wonderful introspective spot that can also be used as a living room. 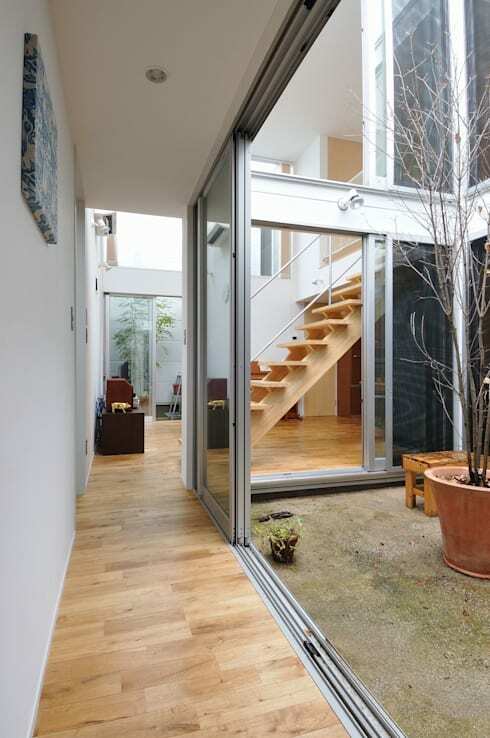 Notice how the interior courtyard is encased all around by glass sliding doors; this allows nature to be a part of the interior design here and was a great way to ensure that the house wouldn’t be enveloped in darkness. On the second floor is the study and home office, which is the only room in the house that faces the outside. Remember the big windows seen in the first picture? That’s here. What you may not have noticed though is that the architects have smartly incorporated a tiny balcony space here! The study itself is a long, narrow space with high ceilings. 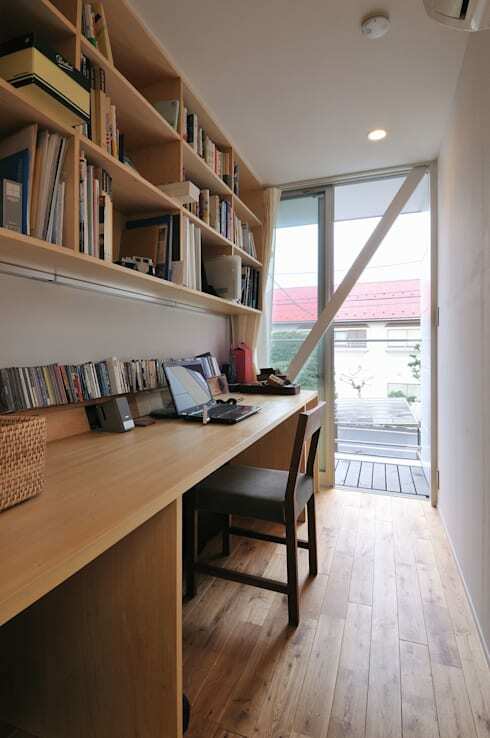 Taking advantage of the latter, the architects built in wall-mounted shelves while devoting the entire bottom space to an extended work desk. Check out A modular home of 75sqm to see another example of smart design in a limited space. What did you think of this streamlined modern home?